Karl Jackson, Network Architect, 8el, UK "DNSBOX allowed us to build a best-practice split DNS architecture in an affordable way." Harmohan Sood, Reach Internet Ltd, UK "DNSBOX is one of the most reliable elements in our enterprise. Simple to install and configure, it has required zero maintenance"
CTO, Texas Association of Local Health Officials, USA "Repetitive tasks that are complex need to be delegated in a secure way; DNSBOX delivers a good return on investment for companies." Samson Oduor, Access Kenya, Kenya "DNSBOX’s in-built monitoring system shows physical device health and gives a clear picture of logical resources utilization." 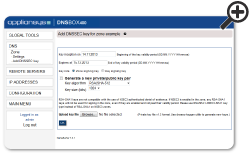 Many organisations want to introduce DNSSEC to protect against cache poisoning which can result in your users being misdirected to malicious websites and/or disrupt services that rely on DNS such as email and VOIP. DNSSEC uses strong public key cryptography to sign DNS data which can then be validated by a requesting server. The root DNS zone and a growing number of Top Level Domains now sign their DNS records using DNSSEC, which creates a ‘chain of trust’ to validate answers down to an individual record. Many ISPs and public DNS services, like Google DNS, can also now carry out this validation process and some governments have required their public sector agencies to implement DNSSEC – for example in the USA. Keys also need to be periodically updated – known as ‘key rollover’. Key rollover is particularly complex and requires very careful administration. If you get key rollover wrong, keys which are no longer valid remain cached in other DNS servers around the world or are not synchronised with your own upstream servers. In such cases, clients using DNSSEC would be unable to resolve your records. To avoid this, you need to manage at least two sets of two types of key – a Zone Signing Key (ZSK) and a Key Signing Key (KSK), one of each live and one marked as in ‘rollover state’ – for each zone. The rollover keys need to exist for 2x their Time to Live value. With lots to know and manage, manual key rollover is incredibly error-prone.